obsessively creep on their dogs keep their pooch’s weight in check. A Japanese company has created a line of body-monitoring fitness trackers for dogs. Seriously. Fitness trackers … for dogs. It’s called the Wandant and went on sale in Japan today. 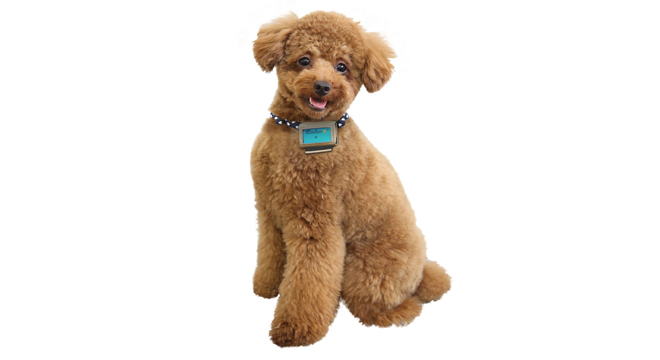 The device, made by Fujitsu, attaches to your dog’s collar. It contains three accelerometers and records data every 10 minutes, tracking info like the number of steps Fido takes and his stress level (based on how much he shakes). Extra-obsessive dog owners can also manually enter information such as food intake and stool condition (used for “benchmarking changes in dog’s health”) and add photos and diary entries to track growth. Data can be stored locally for up to 14 days or uploaded to an NFC-equipped Android device. Stats can also be uploaded to an accompanying subscription-based cloud service that costs $5 a month. Once uploaded, data is displayed in a series of charts and graphs on your desktop or mobile device. The Wandant costs $120 and is available on Amazon Japan in pink or blue. Its battery life is estimated at about four months. A one-year subscription to the cloud service is included in the price. Fujitsu says it has no current plans to sell the device beyond Japan.